Okay, so it's another day later already!!! When life gives you lemons...paint them! Curse of The Cat Skull...!!!! The Cove (5x10,oils $100) I miss Green. Not Christmas green, but...leaf green. The overall green you see in summer. Everything is kind of bare and brown(and depending where you are cold). 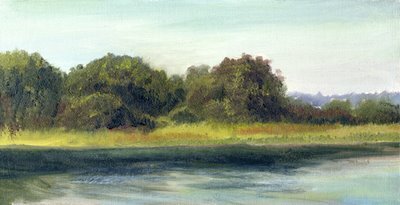 I did this 6x12 painting last summer, in Jamestown, RI. Done in a half-hour session, plein air by the water. Looking back on it, it came out rather...Edward Hopper-esque. There was a bit of humidity at the time, hence the more opaque background. When I go to paint outside all the interesting clouds disappear. Oh well, you get what you get. I've been kinda busy with holiday preparations, so I am using one of my "backlog" images". Besides, it's nice to think of warm summer again. A bit of background on this area-it was badly destroyed by the Hurricane of '38 and some "then and now" pictures are fairly stark in contrast. Now, a question (and no means a criticism). 10 paintings and so far no people. Are they harder to paint in the time constraint? Of less interest/learning value to the experience? Simply not a preference? Which does not imply that I am not enthralled with what has already been posted. Possibly a self portrait(!!) and most likely a study of a gal I am using in a fantasy painting, a larger piece.